Peng Leong from Presbyterian Women just came to the EW Communications Team’s office hours to report about a powerful experience she had in the Human Rights Conversation Circle this morning organized by the NGO Committee on the Status of Women. Peng had a great conversation with four other delegates about how “cultural values” cannot be used as an excuse to ignore the human rights of girls and women. They also talked about how education about human rights is needed across all generations and how military and law enforcement officials have the obligation to protect women. 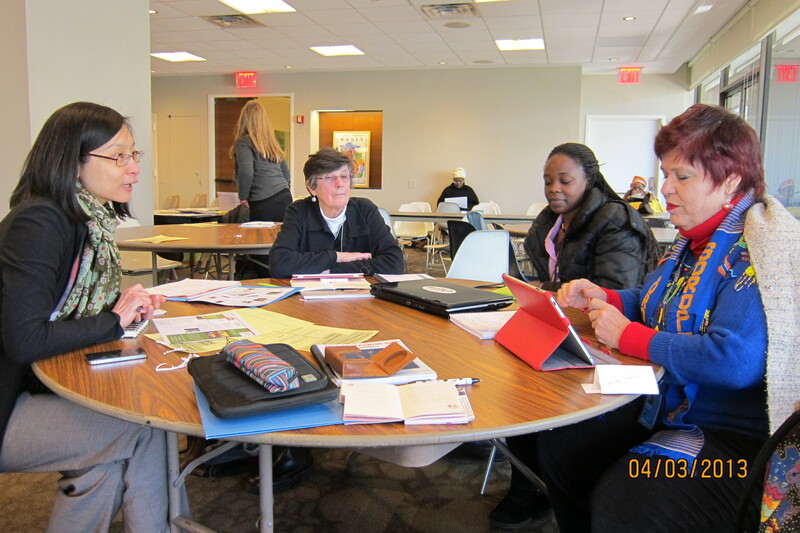 Be sure to check back here at http://www.ecumenicalwomen.org for more stories from #CSW57. And if you’re already here, definitely come down to the EW Communications Team’s office hours everyday from 12p – 3p to share your story with the world! Pictured above: Dr. Marilyn Porter of University of Newfoundland; Veryl Obodi, Program Associate at iLEAP, the Center for Critical Service; Dawn Marie Lemondes, International Program Director for Global Voice for Women; Connie Chow of Women’s International League for Peace and Freedom.